The Mudder kitchen cooking timer is a practical timer for daily limited time activities. 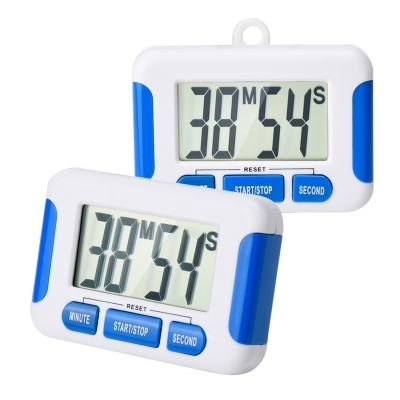 Its character of large digits in 2.0 x 1.1 inches LCD screen and loud alarm can do lots favor to help different generation ages control the time. You will enjoy the cute design and flexible placements with its strong magnetic force, stand and hook back. It can be applied for cooking, resting, sporting, doing facial mask, studying or office timing. 1. Operate it under the conduction of its introduction. 2. When the display is dim or alarm is not clear enough, please change the battery. 3. Press the button M, S over 2 seconds, it will adjust the time fast. 4. It works with an AAA battery (not included). 5. Press the button M and S at the same time, it will clean the previous setting time to zero. 6. This timer alarm is loud which is suitable for those who are weak in hearing.